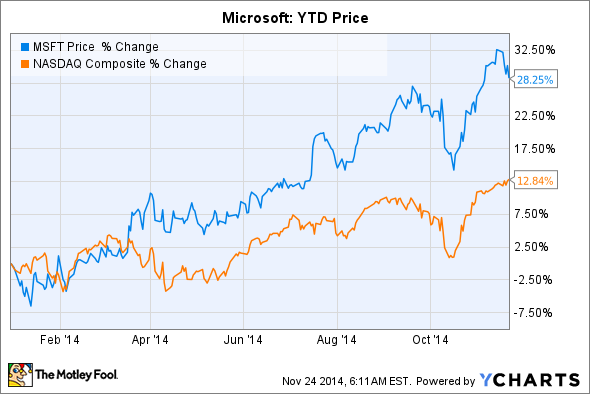 Will Microsoft Stock Head Higher Or Lower In 2015? Microsoft stock rallied 28% in 2014, but does it have room to run in 2015? Microsoft (NASDAQ:MSFT) stock has rallied 28% throughout 2014, easily outperforming the overall market. CEO Satya Nadella's clear vision for the future of Windows, Office, and the cloud has convinced many investors that the tech giant is ready to strike back against Google (NASDAQ:GOOG) (NASDAQ:GOOGL). But can this optimism -- which boosted Microsoft stock to a 14 year high -- continue throughout 2015? Microsoft stock remains cheap despite its year-long rally. Take a look at how it stacks up to industry peers Google, Oracle (NYSE: ORCL), and Apple (NASDAQ:AAPL). Source: Yahoo Finance, Nov. 24. Microsoft's higher PEG ratio means that the market expects it to post weaker bottom line growth than its rivals, but its stock remains roughly as cheap as Apple and Oracle's on a trailing P/E basis. Microsoft also offers a healthy ROE and the biggest dividend. After Microsoft pulled the plug on XP earlier this year, Windows 8 usage skyrocketed. According to Net Applications, global usage of Windows 8/8.1 rose 4.5 percentage points to 16.8% between September and October -- its best monthly improvement in its bumpy two year history. This means Windows 10 could hit the ground running when it arrives next year, especially if Microsoft offers the OS as a free upgrade for Windows 8 users. Microsoft's cloud-based ecosystem is also growing quickly. Last quarter, Office 365 subscribers rose 25% sequentially to 7 million, quashing fears that Google Docs/Drive would kill off Microsoft's cash cow. Microsoft also reported that commercial cloud revenue from Office 365, Azure, and Dynamics CRM rose 128% year-over-year, although exact figures are unknown. Microsoft's vision of Windows 10 as "One Windows" for phones, tablets, and PCs tethered to its cloud ecosystem could help it dig a defensive moat against Google Android. But to advance this strategy, Microsoft must sacrifice profits to gain market share. In April, Microsoft eliminated the license fee ($25 to $90) for all Windows devices (8, RT, or Phone) under 9 inches. In May, Microsoft introduced Windows 8.1 with Bing, a cheaper version of its OS designed for low-end laptop manufacturers to retaliate against Google's Chromebooks. Microsoft also bundled free one-year memberships for Office 365 Personal with OneDrive storage (worth $70) with many of these low-end tablets and laptops, and gave away Office for free to Android and iOS users earlier this month. Microsoft also keeps launching low-end Lumia smartphones to defend its market share in emerging markets against Android One and cheap Chinese devices. It also repeatedly cut Xbox One prices in an arguably futile effort to catch up to Sony's (NYSE:SNE) PS4. When we combine these price cuts with the abundance of free software that Microsoft is giving away, we'll probably weigh down its bottom line throughout 2015. During the earnings call last quarter, CFO Amy Hood offered lower-than-expected revenue guidance for its consumer licensing, phone, and gaming businesses, and expects Microsoft to incur an additional $500 million in restructuring expenses (after $1.14 billion last quarter) throughout fiscal 2015. Lower revenue growth, exacerbated by price cuts, could cause Microsoft to miss earnings expectations and disappoint investors. Investors should remember that Microsoft is a company in transition. There are plenty of reasons to be bullish on the stock -- its strong valuations, the company's dedication to the cloud, rising Surface sales, and the upcoming launch of Windows 10. Yet there are also reasons to be bearish -- engaging in a pricing war against Google while selling low-margin hardware could be rough on earnings, which already dropped 13% YOY last quarter. Investors will likely overlook Microsoft's bottom line blues if it can keep posting growth in cloud-based services while gaining market share with its cheap and free Windows licenses. But if Office 365 subscribers dip and cloud growth slows, this stock could tumble.